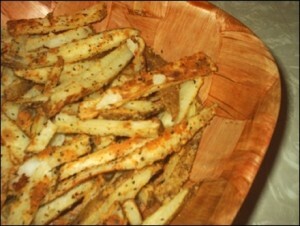 Rich Fries recipe by Akbar at PakiRecipes.com. Cut potatoes in long and square shape then wash and drain all water. Put Gram flour, salt and chilly powder and zera in potatoes and mix with hands you can add one or two table spoon of water. Mix and wait for 10-15 minutes warm oil for frying in a pan and before frying again mix so that all paste is equally pasted on potatoe chips. Deep fry and serve with Rice, Fish, Tea etc.